There are a number of opinions about how to hunt food plots. 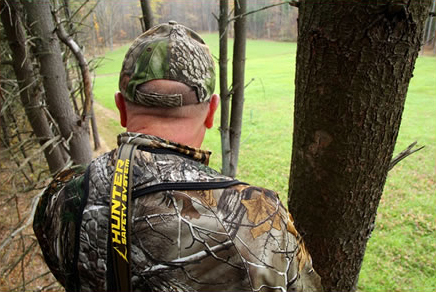 Some believe you should never hunt directly over a plot. If you have large acreages it is a good idea to have a large feeding plot near the interior of your property that is part of a sanctuary area for the deer. On smaller properties and on large acreage the following ideas have proven to be successful for hunting food plots. This can be accomplished by having someone drive you to your stand with a UTV or truck and pick you up at the end of shooting hours. This will keep from leaving human scent all over the plot and if there are deer in the plot it will push them off without alerting them to being hunted. If you have to walk to your stand make sure you practice good scent control and if possible try and stay concealed while walking to your stand. We highly recommended to have at least 2 stands set up on the plot to accommodate the wind direction, You don't want to hunt a plot and have the wind blowing across the plot because almost always, does and young bucks are the first to enter the food plot. 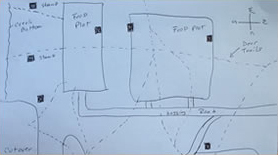 Find the deer trails leading to your food plot and setup your stand(s) off the food plot and between the food plot and bedding areas. But remember to think about wind direction so your scent isn't blowing in the direction the deer are traveling from. You also need to take into consideration access to the stand. You want to be able to slip in quietly and leave as little sign as possible of your presence. Typically afternoons are best for hunting food plots. If you are going to hunt them in the morning consider waiting just until you have shooting light so you can look in the plot to avoid bumping them out in the dark Plus, you might just be lucky and get to shoot your buck before getting to your stand. Early season you will see a lot of activity of deer feeding in your plots. The first few days of the season, you can catch a mature buck feeding in the plot during legal shooting hours. As the season progresses you will notice less bucks especially mature bucks in the plots because of hunting pressure so the best strategy is to hunt the stands off the plot. This might give you an opportunity at a buck coming from his bedding area heading to the plot but not getting there until after shooting hours. When the rut kicks in you can go back to your plot stands because the bucks will come looking for the does that are using your plots. Late season is also a good time to be hunting over food plots. When the weather is very cold and nasty bucks will need to feed and you might just catch that big buck you have been hunting for. Would you like to read more articles like these? Sign up for your Free copy of Whitetail News Magazine and Breaking Ground newsletter. Whitetail news is the most read food plot and deer management magazine in the world and Breaking Ground is packed full of useful tips and tactics.